If for some reason you were lusting after the Archos 43 upon ogling the company's lineup of Froyo tablets, good news, you can buy one right now from Archos, for a tidy sum of $250 (this is for the 16GB model, the 8GB model is not currently available). What does a quarter of a grand get you? 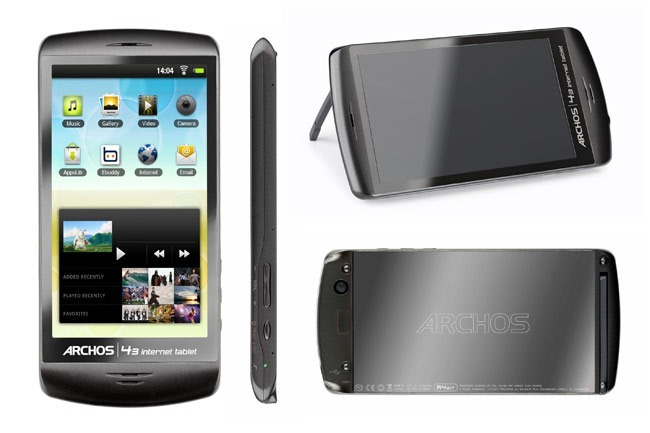 We've provided Archos' full tech specs at the end of the post, as they're quite lengthy. Currently, Archos appears to only be shipping the 43 to Canada and the US, via their online store - somewhat odd, as they are based in France (the French store shows the device is still "Coming Soon"). It's a tablet - sort of! It's definitely worth noting that while the 43 is packing Froyo, it does not seem to run on a Google-approved version of Android. This means you'll be at the mercy of Archos for software updates, a relatively small company. Sounds like a pretty good candidate for CyanogenMod. It has no access to the market, and presumably won't have access to any of the Google Android apps out of the box (Maps, Goggles, Gmail, Navigation, Talk). The 43 does include access to AppsLib, which has been marketing itself as the Android tablet "alternative" to the Market. Are you planning on buying a 43? Have questions or an opinion about it? Let us know in the comments.
. 135 x 65 x 9 mm . 5.3. x 2.6. x 0.4. ARCHOS 43 internet tablet, earphones, Standard USB cable, Quick Start Guide (QSG), legal and safety notice.